Think Norway is too expensive for souvenirs? While it’s nowhere near as expensive as you’d think, especially with the drop in the krone, it’s true that bargains are hard to come by. But for those on a budget, nothing beats souvenir shopping the local supermarket. If you read this website regularly, you’ll know I’m a foreign supermarket fanatic. 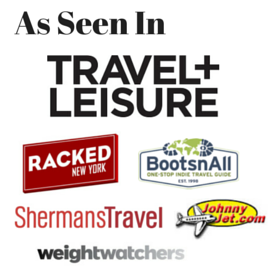 It’s a great way to get an insider’s look at local life– I love checking out what people are putting in their baskets. While it’s fun to pick up some actual take-home souvenirs, I also spend a good deal of time just browsing the aisles, even for frozen and fresh items I can’t possibly take home. 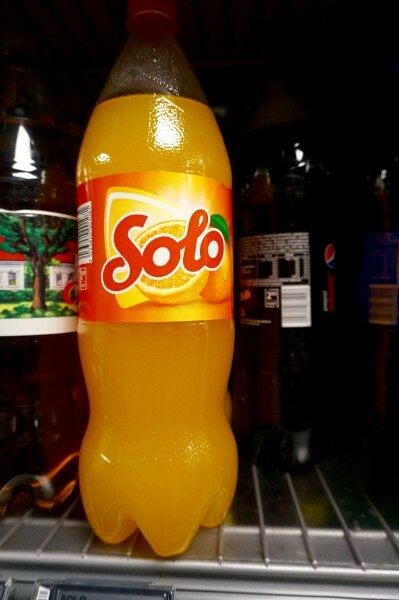 I especially love to find unusual regional items and cult favorites– like the Norwegian devotion to orange soda and a certain brand of frozen pizza (more on this below). 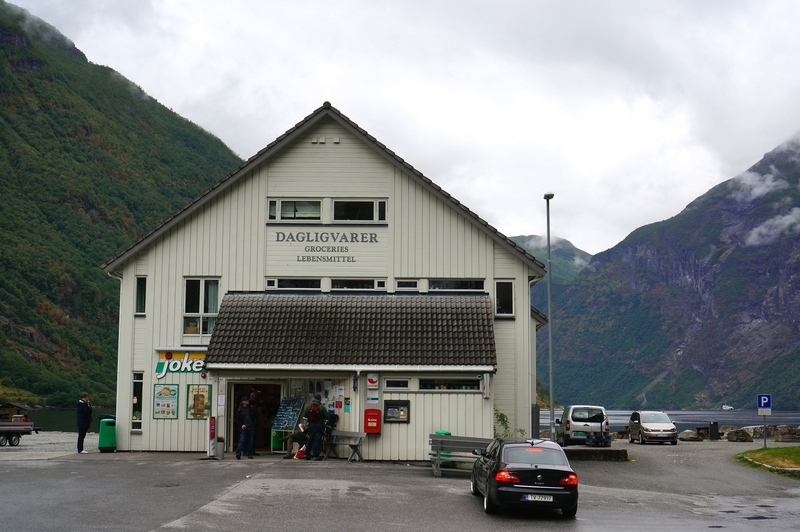 This grocery store in the village of Geiranger has insane views. Norway’s famous brown cheese (called brunost) gets its distinct color from the carmelization of boiled milk, cream and whey. The taste is slightly sweet, best served on a slice of toast or crisp bread. A display case of brunost at a Norwegian grocery store. This is what brunost looks like when sliced thin (with a Norwegian cheese slicer, natch). 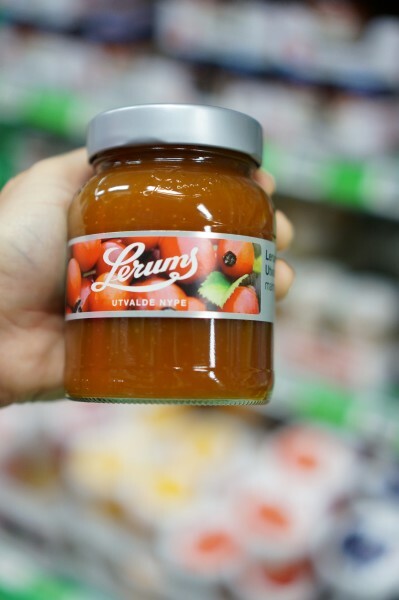 I taste-tested several Norwegian jams on waffles and pancakes at cafes throughout Norway, but took an immediate liking to the brand Lerum’s. Fortunately, Lerum’s is available in any supermarket. I brought home the strawberry, but for a truly Norwegian product, try the tart cloudberry flavor. While I love to cook, I’m not the best baker, so I have a small fascination with instant baking mixes. Of course, you have to deal with the metric system and Google translate, but it can be a fun experiment. 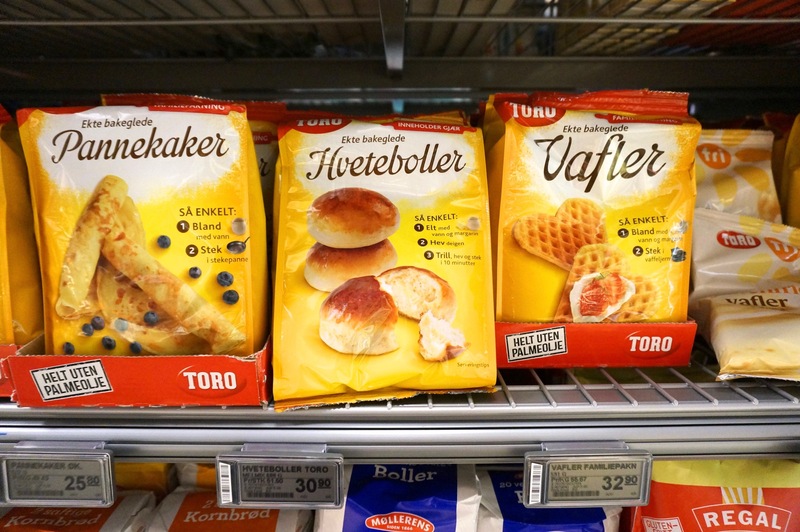 I saw mixes for many Norwegian staples, like pancakes, waffles and hveteboller. 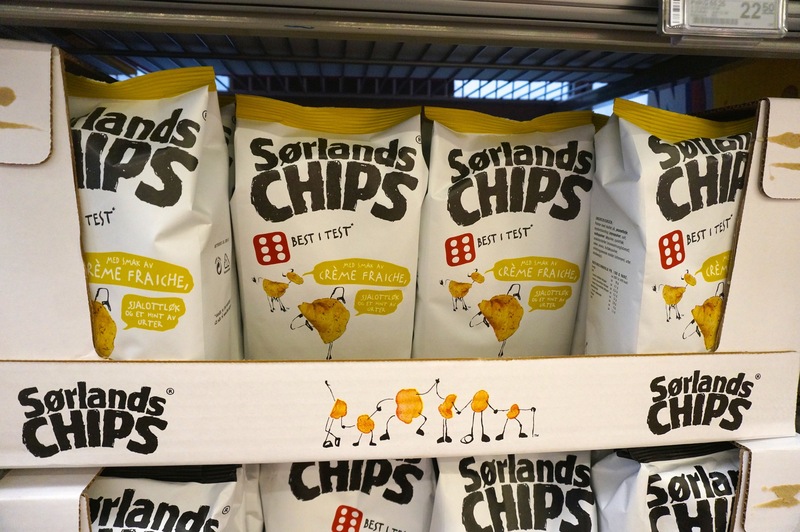 Sorlands were recommended to me by locals, and although I didn’t bring any home we did pick some up for snacking on our road trip to Trollstigen, and I can confirm they are tasty. I didn’t bring home any packaged supermarket bakery goods, but I did eat fresh Norwegian bread every morning and sampled the skillingsbolle at a great bakery. While a bakery should always be your first choice for immediate consumption, for practical purposes, if you are looking to have something keep a bit longer a packaged good might be a better choice. Every country seems to have slight variations in standard condiments, so I usually pick up the local mayonnaise and mustard to use back home. Nordic countries I’ve noticed have an obsession with hot dogs, so I opted for some local hot dog mustard. By the sheer amount of salmon caviar on supermarket shelves, I can only imagine Norwegians must eat exorbitant amounts of this. 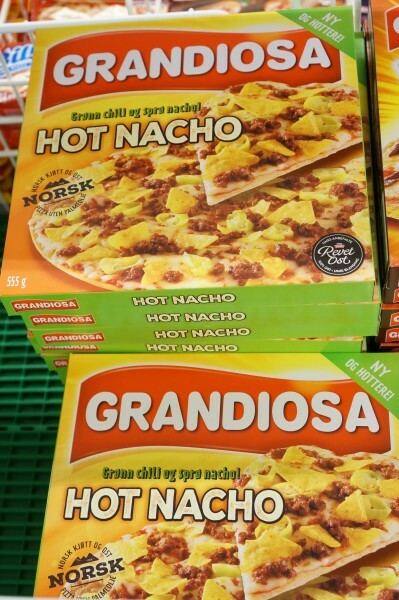 According to Wikipedia, Grandiosa Pizza is “loathed and loved by Norwegians,” has been exulted as the “modern national dish,” while others claim it’s “a piece of cardboard”, “laziness in a box” and “refrigerated evil”. Of course I was dying to try it, but didn’t have an oven, so I’ll have to save it for the next trip. The fresh shrimp looked off the charts delicious. Those tiny shrimp you see everywhere are also sold in plastic containers in a kind of brine. It’s a Norwegian thing, so get a bottle and try it for yourself. 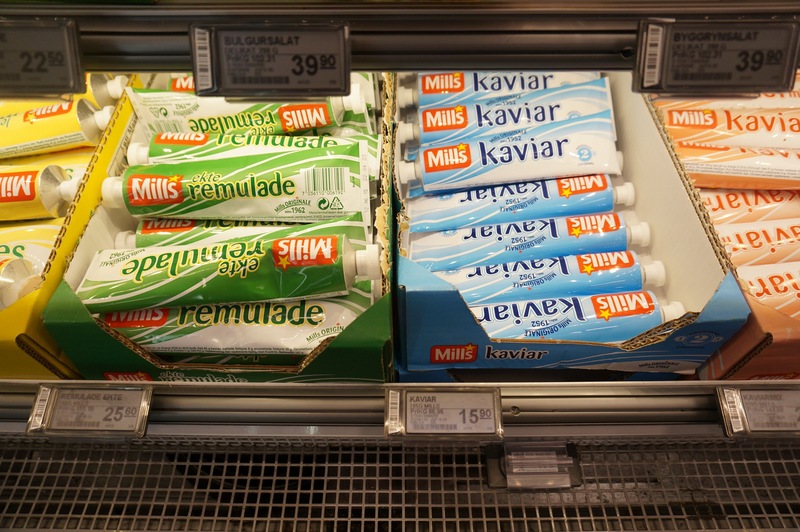 Have you been to a supermarket in Norway? What are your favorite products? Disclosure: While I was a guest of Innovation Norway on this trip, all supermarket finds are my own. I brought back a lot of the chocolate, and everyone LOVED it. They are asking me when I’m going back to Norway so they can get more chocolate from me. Nice post ! You done a great job. This information is too good. Grandiosa Pizza is one of my favorite. its taste is too good. i like it. Smash!!! So horrible for you, but so good. Pretty sure I pigged out on all of these things while living in Stavanger. Leverpostei !! Its like Liverwurst in a can. You will always see a picture of a smiling child on a can of Leverpostei because every schoolkid has it on his or her sandwich everyday. It’s very loved. Hi! It was nice to find this because I’m going to Oslo this Saturday. I’m from Finland and I have to say that Tyrkisk Peber is actually Finnish candy. Fazer is a huge candy manufacturer here and if you ever come to Finland you have to try their chocolates. They are the best in the world! I loved the hotdogs (Polse) pepperkake biscuits and skolebrot! Also yeah the chocolate is great! Why didn’t I see that haha, thanks for the tip!! oh that’s good to know, thank you!! Hello! Just discovered this post via Pinterest and just had to leave a comment! 🙂 I, too, love buying souvenirs in supermarkets as they are cheap, loved by family and colleagues and nobody is forced to put Troll figurines on their shelf! My most beloved eatable souvenirs from Norway are Bamse Mums – the chocolate covered marshmallow bears – and Lefse, the soft flat cinnamon flavoured cake! Hi Christina! 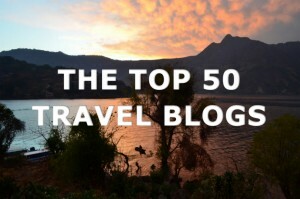 Welcome from Pinterest, I have a huge amount of readers from there! Thanks so much for the supermarket tips, those sound delicious!! Some unique candy that I didn’t like in Norway was salty licorice flavored gummies and chewing gum. Hi there, thanks for commenting! Salty licorice is a love or hate thing for sure! One of my friends is obsessed with it but I can’t quite acquire a taste for it. When I traveled to Norway in 2005 I so enjoyed Gjende cookies. They are packaged in a blue cellophane type wrapper. We called the reindeer cookies because of the imprint of the animal on each cookie. They aren’t necessarily much different from something you could get in the States, but special because we were there. I can get gjetost in our local grocery store. Ooh good to know!! I’ll look for them! 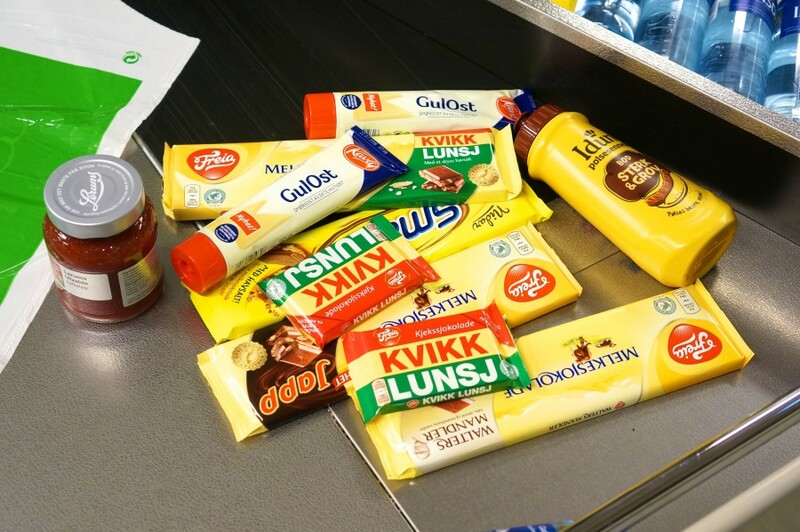 Whenever I’m in Norway this is what I end up with in my basket. Fyrstekake – great to eat with coffee. Svolværpostei – great for the rye bread. Lomper – a must to the hot dogs. Pinnekjøtt – around Christmas time they will have it at the supermarkets and it will be expensive but worth it. Nugatti – better than Nutella trust me. And as shown in the article. Kvikklunsj, Sørlands potetgull, mayonese, and some brunost for my Norwegian fiance. I am myself a Swedish woman. Thanks Leelene! I wish you had been there to advise me! I will definitely try your suggestions next time, I am especially intrigued on the Nugatti. Omg I have to try this!! Need to do a taste test. As a norwegian I can confirm that Freia has the best chocolate in the world! Kvikk Lunsj are one of my favorites! Also, the cloudberry jam is actually rosehip jam! haha yes it was a fun surprise to find a new chocolate addiction! Thanks for the lovely comment! I hope you are having an amazing time!